Pompey were held to a 1-1 draw by 10-man Carlisle in the League Two curtain-raiser today. Carl Baker’s 42nd-minute strike cancelled out Reggie Lambe’s opener in front of a crowd of 17,570 at Fratton Park. Jamie Devitt was sent off as he picked up a second yellow card for a needless tug on Gary Roberts after 29 minutes. Paul Cook’s side created chance after chance as they dominated the Cumbrians. The livewire Baker had a host of those as he was one of six new recruits to have their Pompey debut. Fratton Park was bathed in glorious sunshine and there was a sense of anticipation for the season opener. And Cook’s side responded to that with an encouraging start as Carl Baker forced Mark Gillespie into a sprawling save. Then Michael Smith hassled a mistake out of the Carlisle defence after 10 minutes - the ball was worked to Gary Roberts, who curled his shot wide. Carlisle made the breakthrough though, with their first chance as Lambe burst through the centre and poked a finish past an exposed David Forde. Pompey were given a lifeline after 29 when Devitt was cheaply dismissed for a second yellow card. 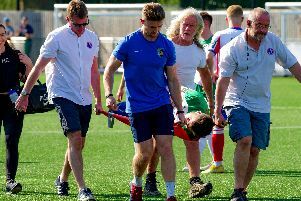 The debut-making midfielder had already been booked after a tussle with Drew Talbot when he walked for a tug on Roberts, with little danger looming. Pompey were having the better of it with both Jack Whatmough and Baker having further chances. But Carlisle went close five minutes before the break as Shaun Miller fired wide from 20 yards, prompting the first murmurs of concern from the home crowd. But Cook’s side were level two minutes later with lovely interplay from Roberts and Baker allowing the debut-making Blues man to fire through Gillespie. Baker couldn’t take any of the three chances which came his way at the start of the second half. The first was the clearest of those as he took a touch from Roberts’ cross and his shot was blocked six yards out. He couldn’t get a touch on another Roberts cross after 54 minutes and then fired a volley just over the top three minutes later. Roberts’ endeavour then saw him beat Gillespie to the ball but he couldn’t get his pass through to Smith with the goal open. It was all Pompey and more fine solo play from Baker saw him turn Jason Kennedy inside out but Gillespie blocked his angled drive. That man Baker was central to proceedings and he drew applause for s cracking 25 yarder which Gillespie tipped over after 65 minutes. Stevens then put in a delicious cross which Smith failed to attack as the home side racked up the chances. The onslaught continued as Pompey went agonisingly close to getting the winner as Rose cracked a peach of a 25 yarder off the inside of the post. Then Bennett cracked a shot from the same distance which Gillespie dived low to his right to keep out. The sub then saw his half volley fly the wrong side of the post with five minutes left. Gillespie was having a day to remember as he produced two fine stops to keep out long-distance drives from Doyle with time ticking down. The chances came right to the very death with Baker screwing a vollley over the top from inside the box seconds before the final whistle.